This week’s roundup of iOS apps offers a closer look at zombies, planets, and donuts—as well as a deeper insight into a classic movie. 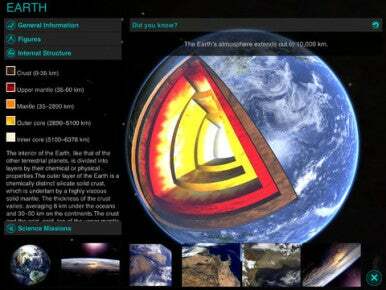 Solar Walk gives you a stunning view of the solar system. See below. 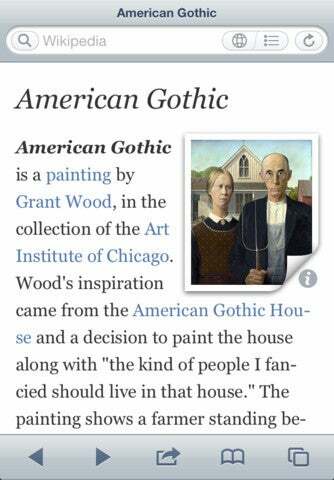 Articles makes Wikipedia beautiful in iOS. 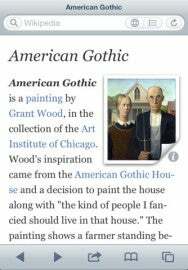 Articles: This $2 app has been taking Wikipedia articles and making them beautiful on the iPad for a couple of years now. This week’s update turns the offering into a universal app that runs equally well on the iPad, iPhone, and iPod touch, but it also has a few other new tricks up its sleeve. The iPad version of the app, for example, lets users do in-page searches for key words and terms. And the app now has a “read later” function, making it easier to reference your references later on. Dunkin’ Donuts: You know all the old jokes about how there’s a Starbucks on every block in big cities and malls? Well, in certain parts of the country—New England, for example—Dunkin’ Donuts is just as ubiquitous. So the new Dunkin’ Donuts app for iPhone should be very popular indeed in those locales. Yes, it lets you browse the menu and find nearby stores quite easily, but the most significant function of the app is that it lets you pay for your donuts and coffee using your iPhone: If you’re in a store, you can tap the app and it will show a barcode—the employee behind the counter will scan it, and your purchase will be charged to your account. (Users can “load” their virtual card with money ahead of time.) And there’s even a social element: You can send a DD Card to your friends so they can buy their own glazed donuts, and know without a doubt how much you love them. Your friend, that is, not the donu—well, maybe a little of both. 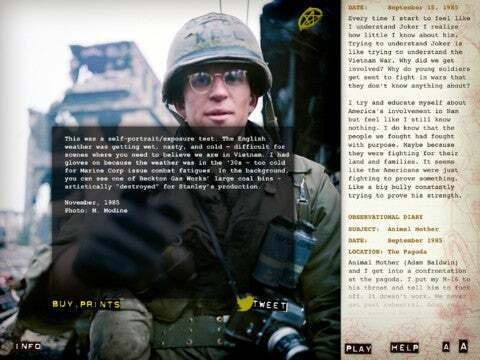 Full Metal Jacket Diary offers a close look at a classic film. Full Metal Jacket Diary: We’ll admit: This is the kind of app where we’d usually pull a quote from the movie and use it to make a joke. Only … none of the really popular quotes from the movie are fit for print. So we’ll just tell you that the $15 Full Metal Jacket Diary app for iPad is the iOS version of a “limited edition” book published several years ago by the actor Matthew Modine, who played Private Joker in Stanley Kubrick’s 1987 classic movie about the Vietnam War. The app contains Modine’s photos and diary from the movie shoot, and includes a four-hour audio version of the text read by Modine himself. Flip’s Escape/Organ Trail: We admit to being slightly bewildered that the iOS platform—one of the most advanced, most elegant pieces of technology ever created by humankind—is so often used to make retro 1980s-style games. Nostalgia is a powerful force. Two new games appeal to days gone by: The $1 Flip’s Escape for iPhone and iPad is a sequel to an earlier 8-bit gamer, The Last Rocket: Flip managed to be rescued at the end of the last game, but now he must avoid asteroids and an interstellar shockwave as he journeys home. The $3 Organ Trail: Director’s Cut is exactly what it sounds like—a pastiche of the old Oregon Trail game, featuring a group of people traveling west. Also, they fight zombies. Things for iPad will keep you organized. 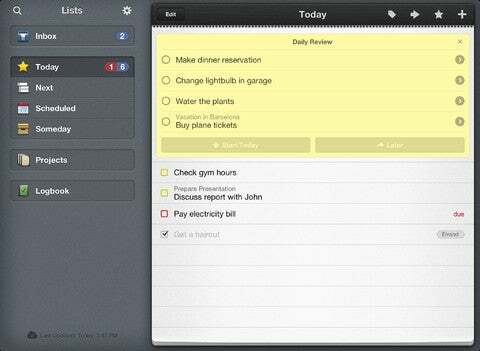 Pronto/Things for iPad: Still needing help getting things done? We offer two new solutions here: one inexpensive, the other deluxe. On the cheaper end of the spectrum, there’s the $1 Pronto app for iPhone, a purple-hued offering that helps you track your deadlines and offers both countdowns and notifications of impending due dates. Meanwhile, the $20 Things for iPad has received a significant update—one that’s free to existing users of the app. Among the many new features in the app is Things Cloud, which lets users sync their tasks and appointments between their iPad and other devices where they do work. There is also a new Daily Review to help you see your day’s activities at a glance. Solar Walk/Mars Panorama: This $1 offering for the iPhone and iPad was already one of the coolest apps in the galaxy, and now it’s got even more features and amazing images of our solar system. It includes new information depicting the internal structures of planets circling the sun; there are also new depictions of asteroids, comets, and dwarf planets. The update also includes enhanced graphics, and new gesture support to help users view the planets and their movements from unusual angles. But if your curiosity is limited to planets closer to home—say Mars—you might want to check out the Mars Panorama Web app at the 360Cities blog. The panoramic photo can be viewed just fine on a computer screen, but it really comes alive on your iPhone or iPad—swing your device around and your view of the Martian landscape shifts with it. It’s almost like being John Carter’s neighbor. Other apps of note: Amazon Instant Video updated with a new search function to make it easier to find movies … Photo Delight is now optimized for Retina displays on new iPads …. the Imo instant-messaging app added VoIP-enabled voice calling … Pinterest updated its iPhone app to include iPad compatibility … Rowmote Pro improved its control over AirPlay mirroring … and TiltShift Video updated its user interface and added new video effects.